The grandeur of Versailles, with interiors by Charles Le Brun and gardens by André Le Nôtre, cannot be overstated. Louis XIII had constructed it as a lodge in 1623, and Louis XIV expanded it into a palace, moving the royal court there in 1682. 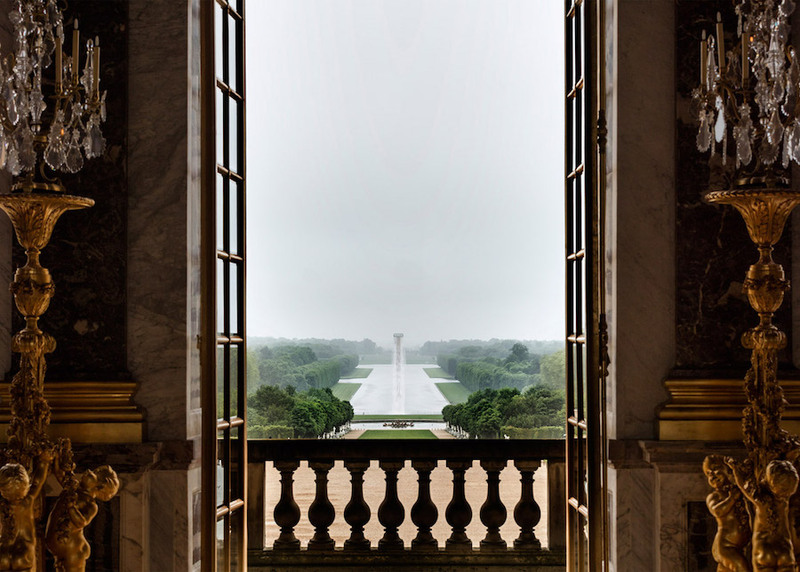 Versailles was the seat of political power in France and a gilded symbol of the Ancien Régime and royal absolutism until 1789 when Louis XVI and Marie Antoinette were forced by the Revolution to return to Paris. 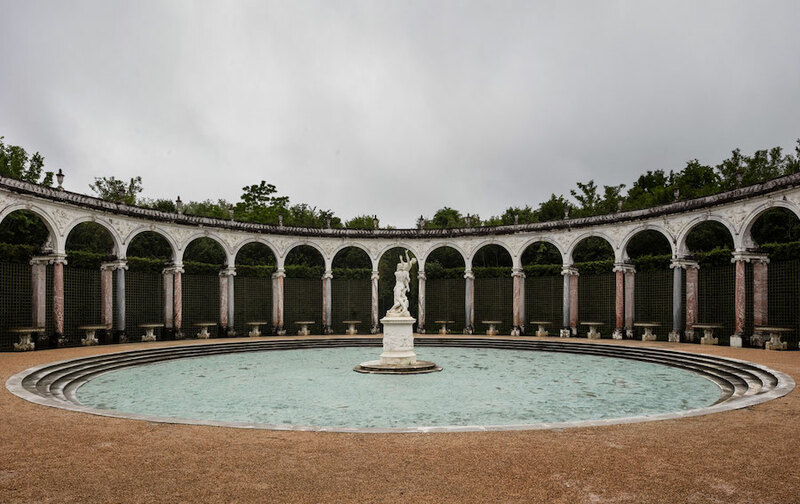 With its wealth of history and classical French art, the Château de Versailles remains an unmatched representation of sovereignty and patrimony. The most visible of Elíasson’s interventions is Waterfall, a 40-meter cascade of water in the Grand Canal. 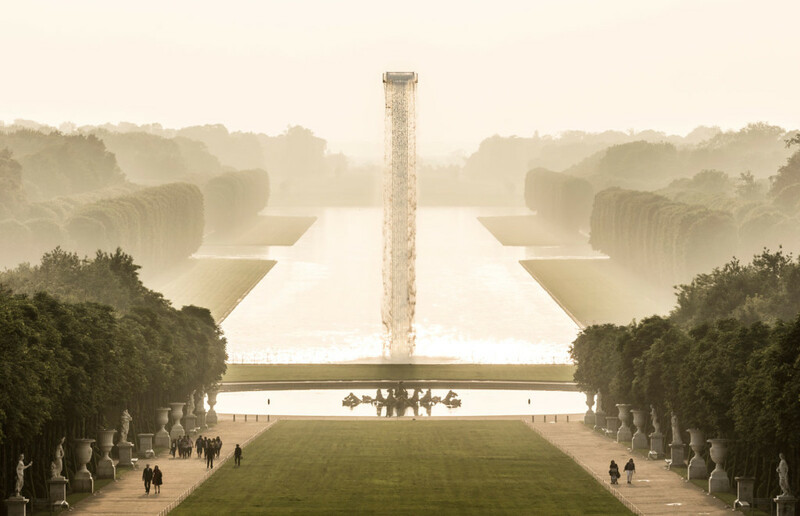 Apparently Le Nôtre had plans for a waterfall that was never realized. Behind the Bassin d’Apollon, Elíasson’s Waterfall is visible from the palace and from a great distance beyond. Its incredible height is calculated so that on the summer solstice, June 21, it will obscure the sun from some viewpoints. In the Bosquet de la Colonnade, Elíasson has covered the ground with 150 tons of glacial rock from Greenland for Glacial Rock Flour Garden. The powdered granite results from glacial erosion, and appears foreign in contrast with the surrounding colonnade of marble columns and a 17th century sculpture of Persephone. The material may provide an extension of Elíasson’s 2015 Ice Watch installation, which melted glacial ice in Paris during the UN Climate Summit. The Bosquet de l’Étoile contains water in another state – fog. 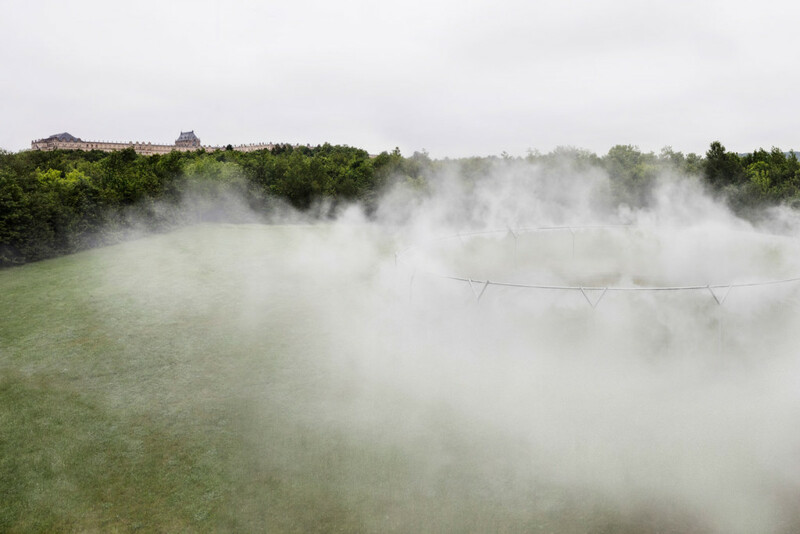 Elíasson’s Fog Assembly emits fine mist that fills the grove with clouds. Naturally, the effects will change with weather conditions. 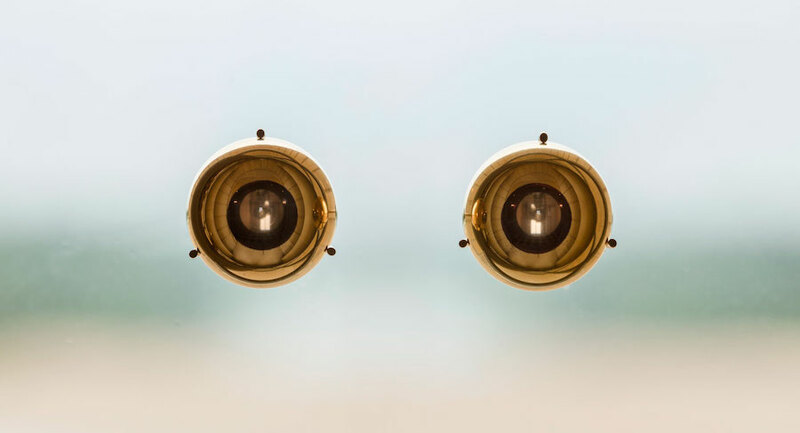 Taken together, these three outdoor installations form a triptych on the theme of water. Inside the palace, Elíasson’s installations of mirrors and lights are restrained within the ornate interiors. 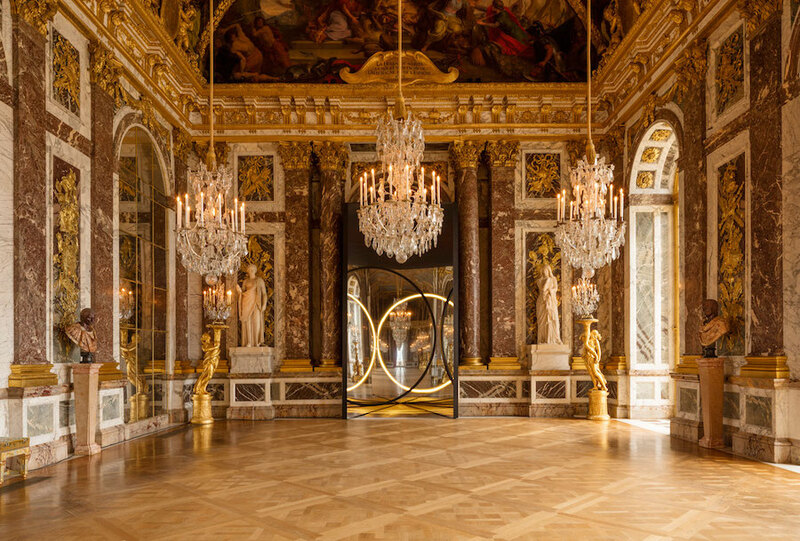 At the end of the Galerie des Glaces, Your Sense of Unity is an illuminated circle on the third side of a triangular vertical mirror, creating endless reflections in the famous Hall of Mirrors. 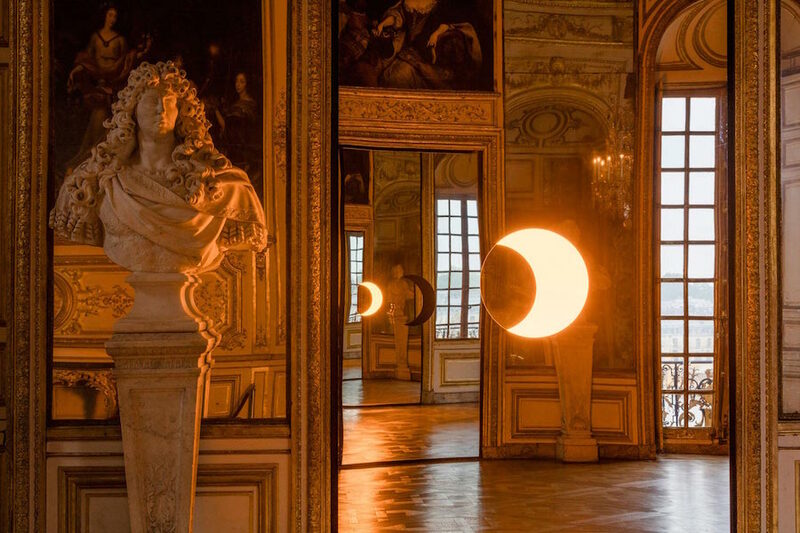 In the Salon de l’Œil de Bœuf, dual installations of Deep Mirror (Yellow) and Deep Mirror (Black) form the shape of a solar eclipse just outside the Sun King’s bedchamber. This symbol of Louis XIV is combined with the visitor’s own reflection, again repeated in other mirrors. 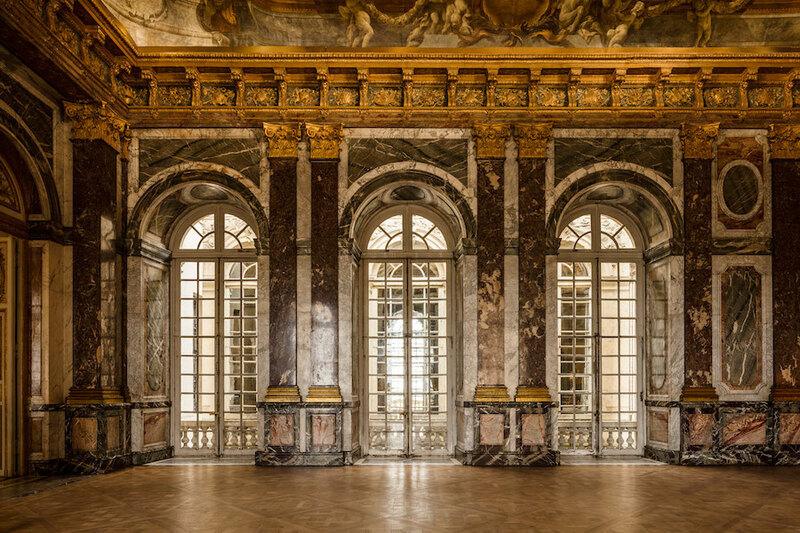 The Curious Museum, in the Salon d’Hercule, creates a trompe l’oeil with mirrors outside the palace’s windows. The viewer’s gaze out is reflected back in, confounded by the additional reflections of the exterior façade and the dramatic figures of an 18th century allegorical painting inside. 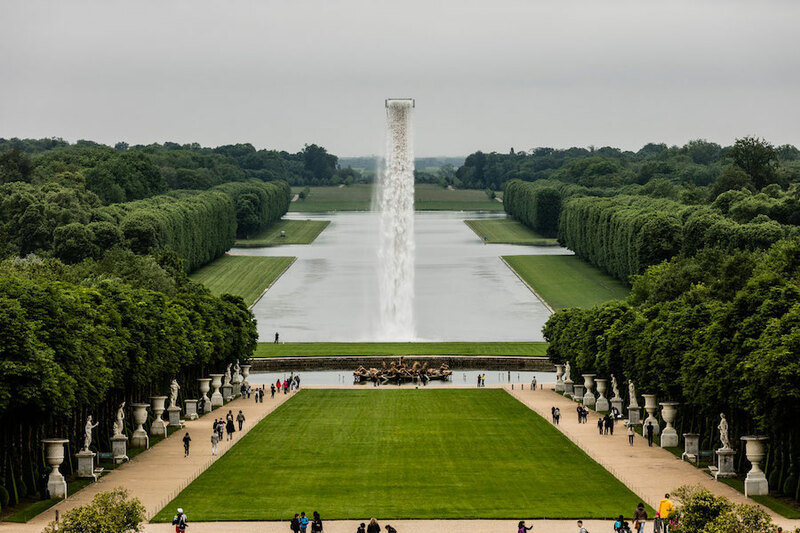 Ólafur Elíasson opened at the Château de Versailles on June 7 and continues through October 30, 2016.